Brodi Ashton is a writer, blogger and lovely person with many inspiring quotes on life and living. The successful author and her family are residents of Utah; she is the holder of a Bachelors Degree in Journalism and a Masters Degree in International Relations. "Some Time Some Times Our Heart Crack A Little"
Brodi Ashton describes herself as an ordinary person; she is reported to have said of herself, she enjoys writing novels for young adults, eating cinnamon bears and really loves diet coke. Pretty simple for an author who has two publications that according to HarperCollins publishers are rated perfect 10’s. 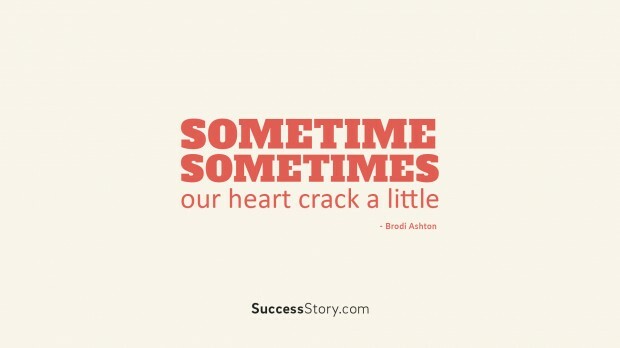 Brodi Ashton has numerous inspiring quotes some of which are incorporated in her books and on other websites. Many people around the world myself included area huge fans of her quotes, books and articles based on style of thinking reflected in her words. Brodi Ashton’s books are fiction often containing themes such as love, loss and immortality that can be inspiring and useful in drawing parallels with our daily experiences. It is probably for this reason and her mastery of writing that so many are drawn to her words and quotes. For this reason, the author has many quotes you can share with friends ranging from shorts ones; just a few words long to longer ones several sentences in length. Brodi comes across as a funny and easy going personality with publications that reveal a very intense and personal relationship with life and its many experiences. Brodi Ashton would be just the candidate for you if you love to share realistic everyday quotes.